On her strange, blue shoes she moves gracefully, and the horse-hair whip that she holds in her hands flows from pose to pose. Cai Lun (He Ling) is in a garden thinking about what she can give the Emperor to write on, as he's endlessly dictating missives to all corners of his realm. It's Ancient China, and her current options are silk (too expensive) and bamboo (too heavy). And so, the woman in the garden invents paper. 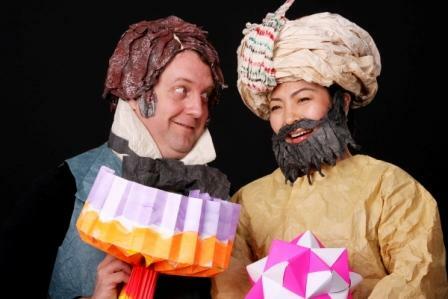 In Pangaea Arts' recent production The Life of Paper, the garden scene is only one small step in the history of origami, which forms the subject of the play. That history begins at the Chinese Emperor's court, and travels through parallel timelines in Asia and the Arab world, before coming to the West through the German kindergarten system, oddly enough. To tell the story, director Heidi Specht uses Asian and Western theatrical traditions, and almost everything on stage from the wigs to the scenic elements are made out of paper (origami artist Joseph Wu, with the help of many). The most popular image of origami is probably the paper crane that people fold by the hundreds as a symbol of peace and hope. Not surprisingly, therefore, some of the most successful moments on stage involve birds of all sizes. In one such moment, two Japanese women (performed by He Ling and Yayoi Hirano) recline on a mat centre stage. In song and speech, Hirano tells the story of the Crane Wife who wove bales of precious cloth from the feathers of her own body in order to please her husband. The great effort it took finally killed her. To one side of the mat, other actors manipulate simple paper puppets on a paper set to match the story being told, giving the characters' movements a formal lifelikeness. Tiny heads turn on cue, paper bodies fold with an easy kneeling grace. The Orchid Ensemble's music (composer Judy Specht) accompanies the scene from the other side of the stage with a mixture of repeated melodic phrases, and modal passages. The total effect is spell-binding, as a good story should be. In its beauty the scene still highlights the weaknesses in the script. Origami is the erstwhile hero of the work, but it's hard to relate to a paper hero. On the other hand, we might like to linger longer with the Crane Wife, but she doesn't really further the story. Despite many interesting scenes, including a stylized battle with paper soldiers dangling from a puppeteer's frame, that human story is less effectively told. Only a single character (Lenard Stanga as the narrator) takes the entire, thousand-year trip with us. As a result, the work is ultimately uneven. Even so, I think Pangaea Arts is involved in some of the most important work in Vancouver right now. Where are the artists?, Lenard Stanga asks from the stage. He's asking about artists who will take origami and develop it further as an art form, taking it past a technical display of skill. He could ask the same question about creating intercultural, interdisciplinary world arts. Besides Pangaea Arts (who makes that kind of work its focus) and one or two other organizations, where are the artists in intercultural work in theatre, and particularly in Asian-Western fusion? Why is there so little of this work on our stages in Vancouver? Statistics Canada recently published the results of the 2006 census, and for anyone who hadn't already noticed the cultural richness we live in, the data showed that our city is increasingly diverse. At other times, in other places, this kind of diversity has resulted in a quantum leap in the development of new artistic genres. What if Vancouver became the next place where entirely new art forms developed, based on an interplay of different cultural traditions? Just like jazz developed when African and Western music merged in the US, just like tango developed from the multiple, cultural influences in Argentina, just like modern origami shows the influence of Asian, Arab and Western design-- we could be the place where the next influential art forms begin. And with all the activity in creation-based theatre in this city, I don't see why we couldn't reinvent theatre in the process. It's necessary to avoid cultural appropriation, but the fear of being disrespectful towards another culture can sometimes work against us in developing new art forms. Panagaea Arts appears to be mindful of these issues. Almost too mindful. An Arab tile setter appears on stage half-way through The Life of Paper, to represent (I assume) the influence of Arab designs and mathematics on origami patterns. However, this tile setter is a slight Asian woman badly disguised with a paper beard, who has little to say or do onstage but arrange red and white paper shapes half-heartedly. Did this scene develop in this way because Pangaea Arts didn't have an opportunity to establish a meaningful partnership with Arab theatre and design artists, and didn't feel they could make things up? Did the scene occur because they ran out of space in the script but didn't feel they could tell the history of origami without acknowledging the Arab influence? In moments like these, The Life of Paper is thoughtful, and earnest, and just a bit dull. Powerful artistic works won't happen when we're too careful and too polite, too focussed on education. Maybe that's the stage we have to start in, but we've been living in a diverse society for 150 years, and we still have segregated audiences for different cultural traditions in this city. Only rivetting cultural expression will draw both audiences into the same hall. Despite Vancouver's impressive ethnic diversity, I've seen nothing on stage here that comes within a country mile of Japanese director Yukio Ninagawa's Macbeth, performed entirely in Japanese without subtitles, which I saw twenty years ago in Ottawa (of all cities), and will never forget. Ninagawa applied elements of Kubuki and Japanese contemporary theatre to one of the most famous scripts in English stage history. The production didn't emerge from a void, the brilliant impulse of a single mind. It was part of a history of theatrical and film directors in Asia, who had experimented with the same Western work in many different ways for decades. And from that production, which is probably the most visually stunning piece of theatre I've ever seen, but at which I could not understand a single word, I also learned more about the character of Macbeth than in any other production I've seen. I experienced that production as a triumph of Asian-Western fusion in theatre, but it didn't come from here. I know that over here, on the ragged West Coast, theatre companies struggle with minimal budgets and tiny audiences. Nonetheless, Pangaea Arts can't do this work alone. Intercultural, interdiscipinary arts are hard to make, because they stretch us farther than most of us want to be stretched, and they require all of us to learn more than we think we have time to learn. It should be no surprise that the successes, as evidenced by The Life of Paper, are modest so far. But it could be the most exciting work we ever do. This work needs company: artists and audiences; and that means all of us. I'll be searching out whatever I can at this experimental end of theatre, and if I get a chance, I'll try my own hand at integration too. When I got up this morning to write about Life of Paper, my red-haired sweetheart was playing American fiddle tunes on the tenor banjo, but coincidentally he was playing them sitar style. The music evaporated into the BC morning like it was born here. I think he's on to something.